Went to the final Formula E race... it was surprisingly enjoyable! 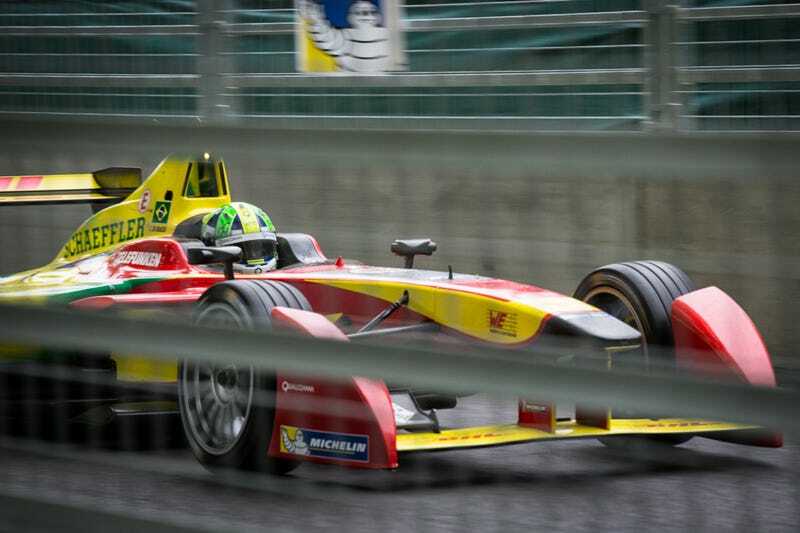 Today saw the last round of the inaugural Formula E championship, in London’s Battersea Park. I went along with some friends, a camera and a fairly open mind, but to be honest I was expecting to be underwhelmed. Well, despite London’s best efforts to spoilt the party - it started raining during qualifying, of course - it was a blast! I have to admit, I’ve been pretty skeptical about Formula E, assuming it was basically a publicity stunt dreamed up by the FIA to divert attention from the less than ‘green’ credentials of more established forms of motorsport. I know a lot of people have criticised it for being gimmicky, with the likes of the ‘fan boost’ and the move away from traditional circuits coming in for a lot of criticism from racing purists. Seriously, tickets were dirt cheap in comparison to F1, and the temporary circuit in Battersea Park, right in the heart of London is so easy to get to. In comparison to the transport nightmare that will inevitably surround next weekend’s F1 race in Silverstone, this is a total winner. You have free practice, qualifying and racing on the same day. When the Formula E cars aren’t out on track, you get a bunch of other ev and hybrid cars bombing around the track (seriously, the i8 looks and sounds like a space-beast on the circuit - wow). Plus, you get a free headset to listen to live commentary and interviews all the time, so you always know what’s going on no matter where you are. You can also install an app on your phone, so you can be watching the race live at other parts of the track when the cars aren’t whizzing past you (or when they are) - it’s seriously impressive. Formula E also seems to take itself a lot less seriously than F1. The drivers aren’t kept hidden away - they come out for interviews and autographs between qualifying and the race start, and there are lots of fun activities for the kids (and grownups) when the racing isn’t on. Formula E cars do not look great on tv in my opinion. However, in the flesh, they are pretty damn beautiful. Here’s a couple of pics taken through the copious quantities of safety barriers they installed. I think they look pretty purposeful. But, what about that sound? Ok, they’re never going to sound as good as a V10 era F1 car (actually, even the i8 sounded better when it was hammering around the track), but there is something otherworldly about the e-cars that I really liked - you should give them a try (and they sound way better than they do on tv). The Battersea Park circuit is not the best - it’s narrow and overtaking is really difficult, but there was still plenty of great dicing today and, let’s face it, when was the last time the F1 season went to the last race in the calendar with three potential championship contenders still fighting it out? Nelson Piquet Jr eventually beat Sebastian Buemi to the overall title by a single point today, despite Buemi’s best efforts to get past Bruno Senna in the closing laps, which would have given him the points needed to claim the title. Considering this was the Formula’s first ever season, I think they’ve done a pretty great job. I’m looking forward to next season, when different manufacturers will be able to race their own chassis and hopefully some of the circuit issues will be sorted. I certainly don’t think Richard Branson is right when he says Formula E will be bigger than F1 in five years time, but I do believe the new kid on the block deserves its place on the racing calendar, and I hope it brings in even more fans to motorsport.